The M11 EOD Multi-Purpose Knife is perfect down range. The M11 EOD Multi-Purpose Knife System was designed in co-operation with the 52d Ordanance Group (EOD), to serve as a multipurpose knife. Has an optional attachable carrier for crimpers, pliers, a flashlight, and one Gerber Multi tool. Designed in conjunction with the Marine Corps Systems Command. Features a 7.00 in. 420 modified steel blade with an overall length of 12.25 in. 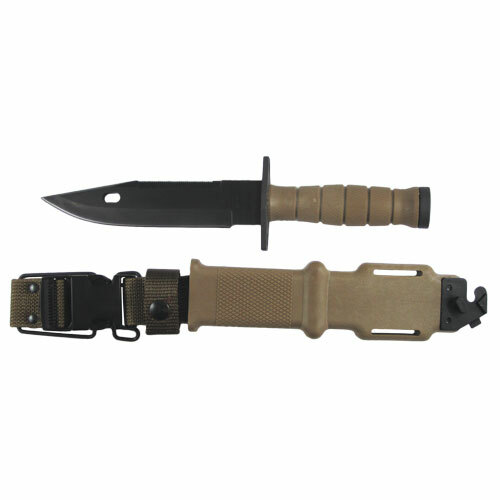 Comes complete with a glass reinforced nylon sheath. • Blade length 7.00 in. • Overall length: 12.25 in. Marked "M11-A1 Lan-Cay USA" on one side of blade and LAN-CAY on the scabbard.